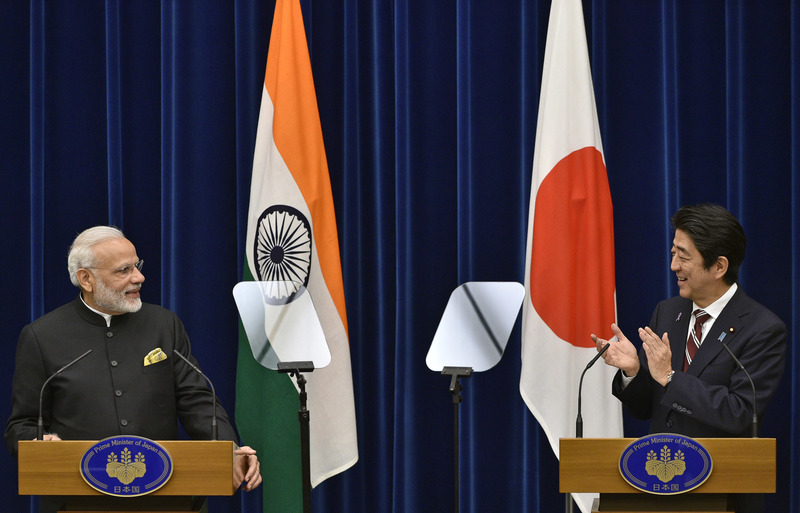 India's Prime Minister Narendra Modi (L) and Japan's Prime Minister Shinzo Abe attend a joint press conference at Abe's official residence in Tokyo on November 11, 2016. Russia is the only country in recent decades which has assisted India’s civilian nuclear power programme. Hence India’s nuclear power cooperation agreement with Russia is different from the series of civil nuclear power agreements New Delhi has signed with many countries, most recently with Japan. India signed a civil nuclear cooperation agreement over the weekend with Japan, the only country ever to have suffered a nuclear attack. The agreement, which took over six years to negotiate and still has to be passed by the Japanese Diet or Parliament, was signed when Indian Prime Minister Narendra Modi visited Japan for the annual summit with Japan’s Prime Minister Shinzo Abe. Japan is the only country other than Russia with which India has an institutionalised mechanism of holding annual summit meetings between the top leadership, alternately in each other’s countries. Russia (and earlier, the Soviet Union) is the only country in the last four decades to have actively assisted India in its nuclear power generation programme, but India and Russia do not have a conventional civil nuclear power agreement along the lines of what India signed with the United States, France, Canada, Britain, Australia, Kazakhstan, Mongolia and most recently Japan. All of these have termination clauses, if India should test a nuclear weapon. In the case of Japan, particularly, India accepted what was termed a “nullification clause,” meaning that the agreement would be terminated as “null and void” if and as soon as India tests a nuclear weapon. Sources told RIR that the exception was made for Japan, which has special sensitivities, as the only country ever to be attacked with atomic weapons. India and Russia have never had to sign a conventional civil nuclear power agreement because Russia has “never sought to put limits or curbs on India’s nuclear ambitions,” peaceful or otherwise, said Nandan Unnikrishnan, Vice President at the Observer Research Foundation, a leading think tank. “Russia is a signatory to the NPT (Non-proliferation Treaty) and the NSG (Nuclear Suppliers Group) and other regulatory regimes, but it has never sought to curb Indian aspirations,” Unnikrishnan told RIR. “It has never been part of a punitive regime against India,” and did not sanction India, even after it tested in 1998. Since then, India has declared a unilateral moratorium on nuclear weapons testing. “It has never sought termination clauses, unlike the Western regimes, and has, in fact, sought loopholes in international regimes in order to assist India,” Unnikrishnan said. When acute uranium shortages hit the operations of Indian nuclear power generation plants, after the 1998 nuclear tests, particularly, and India faced sanctions, Russia found ways to deliver the critical element and ensured Indian power plants could generate electricity. The Soviet Union and India signed an agreement in 1988 regarding establishment of two VVER 1000 MW reactors (water-cooled water-moderated light water power reactors) at Kudankulam in southern TamilNadu state. An agreement signed in 2008 caters for the provision of an additional four third generation VVER-1200 reactors of capacity 1170 MW each. That is why, when India was sanctioned after the 1998 nuclear tests and until it acquired an unconditional ‘waiver’ from the NSG in September 2008, Russia was able to proceed with the building of the nuclear power reactors at Kudankulam. Russia and India (then President Dmitry Medvedev and Prime Minister Manmohan Singh) signed a ‘strategic vision document on nuclear power’ on December 7, 2009 which stated that both sides would strive to complete the construction and commissioning of “not less than 12 units” in the next two decades, in accordance with the 2008 agreement. Towards this objective, India agreed to expeditiously identify a second site, in addition to Kudankulam, for construction of the Russian-designed nuclear power units in India. That nuclear pact with Russia went far beyond the bounds of the 123 pact with the U.S., which calls for the termination of ongoing nuclear cooperation and for the return to the U.S. of equipment and fuel already supplied to India in the event of the nuclear agreement being terminated. Then Russian President Medvedev made it clear that Russia would not accept any foreign-imposed restrictions on its nuclear cooperation with India. The Russian atomic energy head also said the issue of nuclear technology restrictions had never come up in Russia’s cooperation with India. “We do not have and never had this problem with India. This is an issue between India and the U.S., so let them sort it out,” Russian nuclear energy Rosatom head Sergei Kirienko had said after the 2009 summit. Russia has assisted in India’s efforts to design a nuclear plant for its nuclear submarine. In 2009, the Russians stated that Russia would not agree to curbs on export of sensitive technology to India. A new accord signed in Dec 2009 with Russia gives India freedom to proceed with the closed fuel cycle, which includes mining, preparation of the fuel for use in reactors, and reprocessing of spent fuel. Earlier this year, in August, Russian President Vladimir Putin and Indian Prime Minister Modi dedicated the first unit of the Kudankulam power plant to the Indian nation as a symbol of bilateral friendship, famously termed “Druzhba-Dosti”. A “Druzhba-Dosti” vision statement for the next decade was unveiled after a meeting between President Putin and PM Modi in Delhi in December 2014, when the Indian Prime Minister pitched for “at least 10 more (nuclear) reactors” with the highest standards of safety. “It will include manufacture of equipment and components in India. This also supports our Make in India policy,” he said. “We have just signed a document of great significance — the strategic vision for strengthening Indian-Russian cooperation in the peaceful use of nuclear power. It contains plans to build over 20 nuclear power units in India, as well as cooperation in building Russia-designed nuclear power stations in third countries, in the joint extraction of natural uranium, production of nuclear fuel and waste elimination. This will lay the foundation for our long-term mutually beneficial cooperation in the nuclear sector,” said President Putin, after that document was signed. Their summit in Goa in October 2016 also saw strengthening of the nuclear power relationship, with not only the foundation-laying ceremony for the next reactors at Kudankulam, but also the leasing of a second nuclear submarine. As of 2016, India has signed civil nuclear agreements with Argentina, Australia, Canada, France, Japan, Kazakhstan, Mongolia, Namibia, Russia, South Korea, the United Kingdom and the United States. The 48-nation NSG granted a waiver to India on 6 September 2008 allowing it to access civilian nuclear technology and fuel from other countries. India the only known country with nuclear weapons which is not a party to the Non-Proliferation Treaty (NPT) but is permitted to carry out nuclear commerce with the rest of the world.